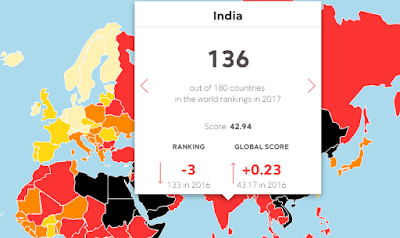 Ranking India 136th in World Press Freedom Index (WPFI), the prestigious international non-profit, non-government organization Reporters, Without Borders (RWB) has directly blamed Prime Minister Narendra Modi’s politics for the country deteriorating its ranking by three points in a year. The only consolation for India is, Pakistan ranks 139th, just about three points worse than India, though what should be worrying India is, it has improved its ranking by eight points in a year. Among other neighbours, Bangladesh ranks 146th, Nepal 110th, Sri Lanka 141st, and China, which has a Communist controlled government, 176th – one of the worst in the world. RWB has two primary spheres of activity: one is focused on Internet censorship and the new media, and the other on providing material, financial and psychological assistance to journalists assigned to dangerous areas. Its missions monitoring attacks on freedom of information worldwide, denouncing any such attacks in the media, act in cooperation with governments to fight censorship and laws aimed at restricting freedom of information, and assist morally and financially persecuted journalists, as well as their families. RWB finds US and Britain slipping by two places to 43rd and 40th positions respectively, while Norway comes out top of the index with the world's freest media, and North Korea taking bottom place. Published every year since 2002, the World Press Freedom Index is claimed to an important advocacy tool based on the principle of emulation between states. “Because it is well known, its influence over governments is growing, many heads of state and government fear its annual publication”, it adds.